Shall we blend tonight darling? Way back in 2008 (ten years folks! ), Scotland exported approx 840 million blended whisky bottles; nine years later the number. almost the same. Single malt exports exploded in this same timespan, from 71.8 million bottles to 122 million bottles, stats from the Scotch Whisky Association. A “blended whisky” is a combination of single malts, often with “grain whisky.” Grain can be made from corn, in a column still. There are many, many (too many’s to put down here) hundreds of cheap blended Scotch oot there, but there are also many fabulous blended whiskies that match single malts. In the mid-19th century, single malt whisky was considered too potent for most. Scotch took off as a dram in earnest, when a Scot had the bright idea to blend fiery malts with mild, low- alcohol grain whisky. Bring on the likes of the Dewars, the Ballantines, the Chivas brothers, and of course, the Walkers (Johnny, not the shortbread). Throughout the 1960s, most whisky was produced exclusively to be blended. Glenfiddich saw an opportunity and grabbed it with both hands. Exports of blended Scotch held steady over the last hundred years, value growing from £2.4 billion in 2008, to £3 billion in 2017, is it due to whisky drinkers taking less volume and going for a higher cost single malt? LESS IS MORE. According to the Distilled Spirits Council; last year, the U.S. demand for super premium blends rose a staggering 11.8 percent. A world-class blender (and recently more of our young ladies are becoming top blenders) draws a flavour profile, then adds untold single malts and grain whiskies, in exacting proportions, to achieve perfection. Experts would suggest drams such as Peat Monster, Spice Tree, Wemyss create intense blends … Spice King, heavy peat and Hive, honey and flowers. The Lost Distillery, mixes single malts to re-create whiskies from long dead distilleries (how they do it is a mystery to me). Black Bull, it is not a cheap blend – take a sip of the 40 Year Old, a rare beast. Malt whiskies from Bunnahabhain and Tamdhu, Glen Grant and Glenlivet, distilled from the mid 1960s/early 1970s, complimented with grain whisky distilled in 1966 (from the now closed) Port Dundas Distillery and a 1965 distillation from the Invergordon Distillery. It’s 90% malt, of the above mentioned with the addition of some of the rarest and most aged grain whisky to be ever added, to a blended Scotch whisky. This 40 year old is bottled and released in small batches, current release batch 5. Every batch is different, so don’t miss out on this one. Thanks Euan. George Willsher had the idea for Black Bull in his blending room at his grocery and spirits shop in Dundee, 1864. The formula he created was for 50 percent of the blend to be made up of single malt whisky, and 50 percent single grain whisky, bottling strength to be 100 (US) proof (50% abv). George did things his own way, far less well known that another guy called Johnnie. In 1974 BLACK BULL hits sales of 80,000 cases into the USA alone, in 2001 it was acquired as part of the acquisition of Duncan Taylor by the Shand family. BLACKBULL is the first and original 100 proof blended Scotch Whisky, first released to drinkers in Scotland in 1864, and has since grown into a global brand, selling in over 35 markets worldwide. One of these market places is here in Perth, where WE dram the Black happily. 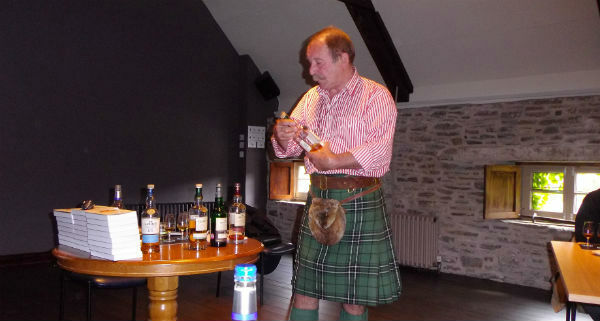 Other drams we should mention here – sadly we cannot give them all, what I will say is, try out the Irish! Let’s keep blending tonight, such a pleasant thing to do don’t you think?